Greg Bennett ST 61- $189. There is a curious mindset with manufacturers about their entry level guitars. They tend to believe that economical guitars need to look cheap! We don’t believe or understand this. A guitar should be visually inspiring, regardless of how much it costs. UNITED STATES (48 CONTIGUOUS STATES). We strive to get your merchandise to you as quickly as possible. Most orders are shipped the next business day after they are placed. Orders arrive within 3-7 business days. If you live in Alaska or Hawaii please contact us for a custom shipping quote. We do not ship online orders to U.S. territories. All returns must be approved first by contacting us for a RA#. 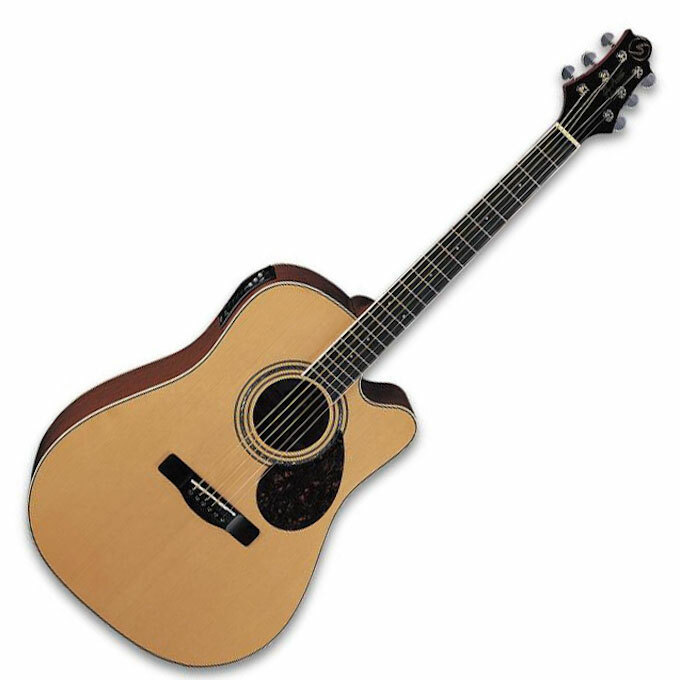 Greg Bennett D5 - $299. Morgan Monroe MGV-200E Acoustic / Electric Guitar $499. Solid spruce tops, walnut back & sides (200 Series), Tiger maple binding, Grover keys and exceptional playability. 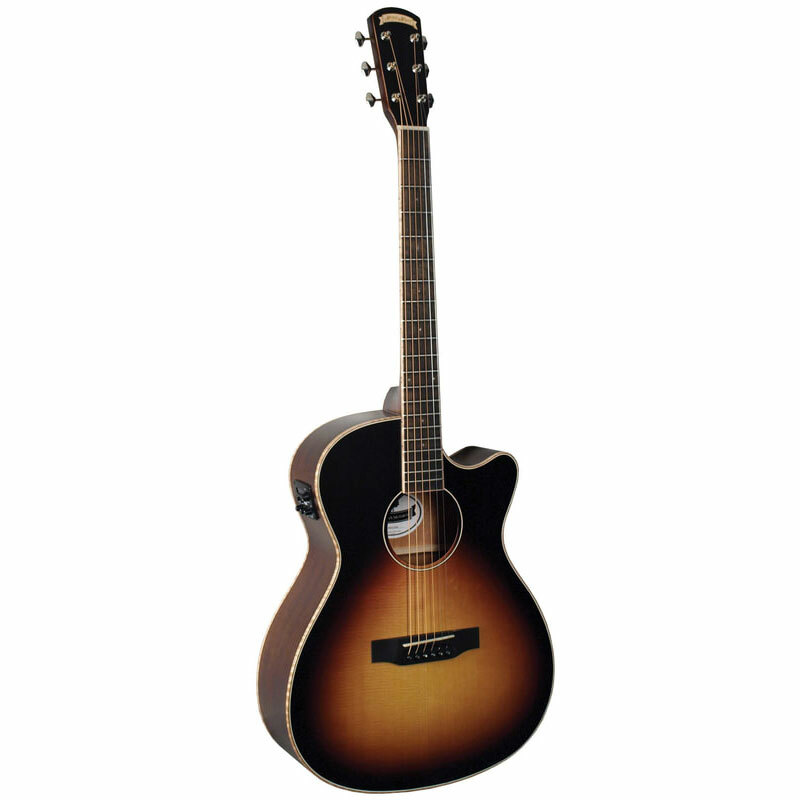 Morgan Monroe MGV-100E Acoustic / Electric Guitar $499. Solid spruce top, mahogany back and sides, Tiger maple binding, Grover keys and exceptional playability. 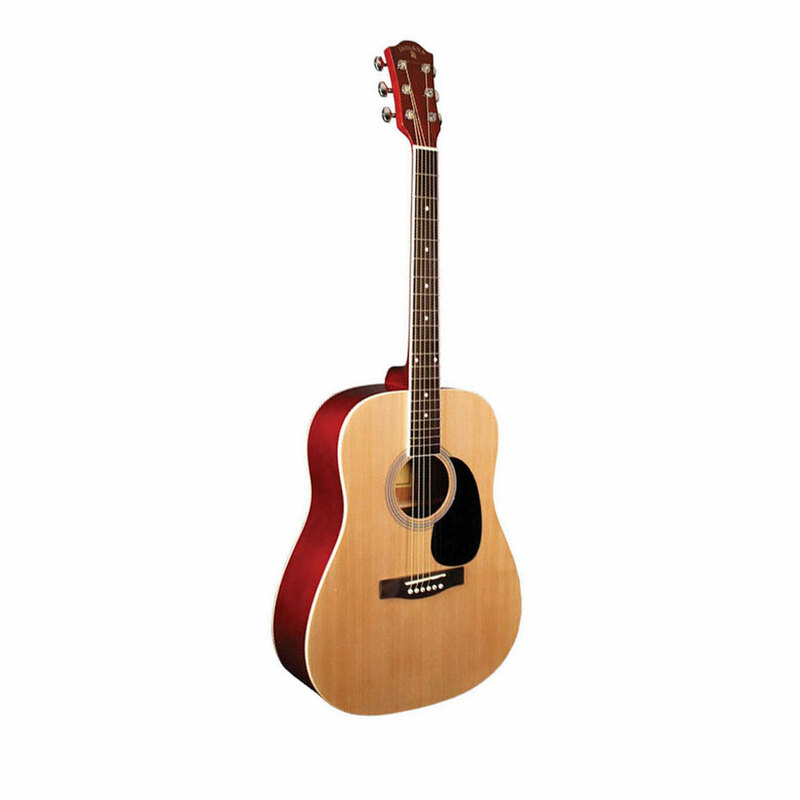 For well over 15 years the Indiana Scout Acoustic has led the league in what you've come to expect for an instrument in this price point. Blindfold tests have proven what we've known all along, that the Scout is more guitar, more value and more bang for your buck than any guitar on the market. Don't take our word for it, ask any player in the last two decades and chances are they either owned, or know someone who has, an Indiana Scout. Our mission is simple: make a great playing guitar that everyone from a beginner to a pro could appreciate. We did just that! Starting with a spruce top married to mahogany back and sides and topped off with nickel silver frets, rosewood fingerboard and bridge, sealed diecast tuners and a high gloss finish, the Indiana Scout proves that the rumors are true. You can have everything! 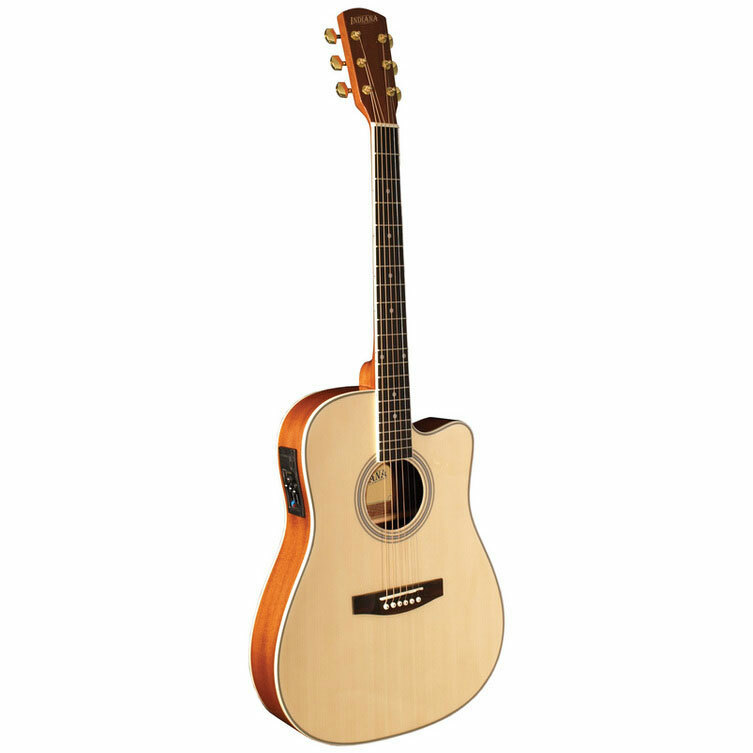 Not that you need it but, we also threw in the Indiana Guitar Company no hassle 10 Year Warranty. The Madison acoustic electric guitars are stunning. 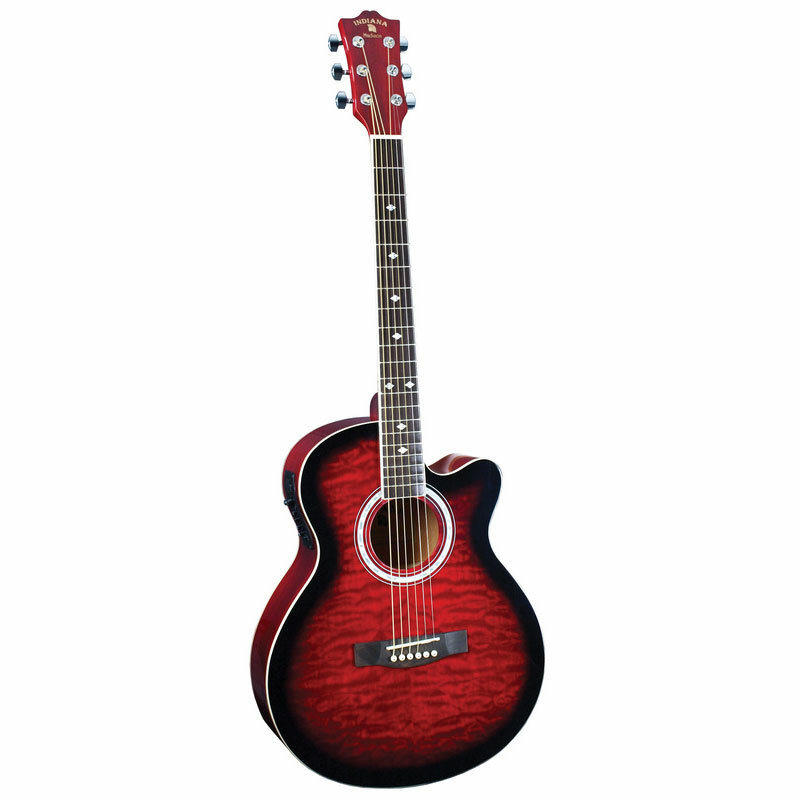 With a slightly scaled down folk sized body, the Madison has a tighter and more ergonomic feel. 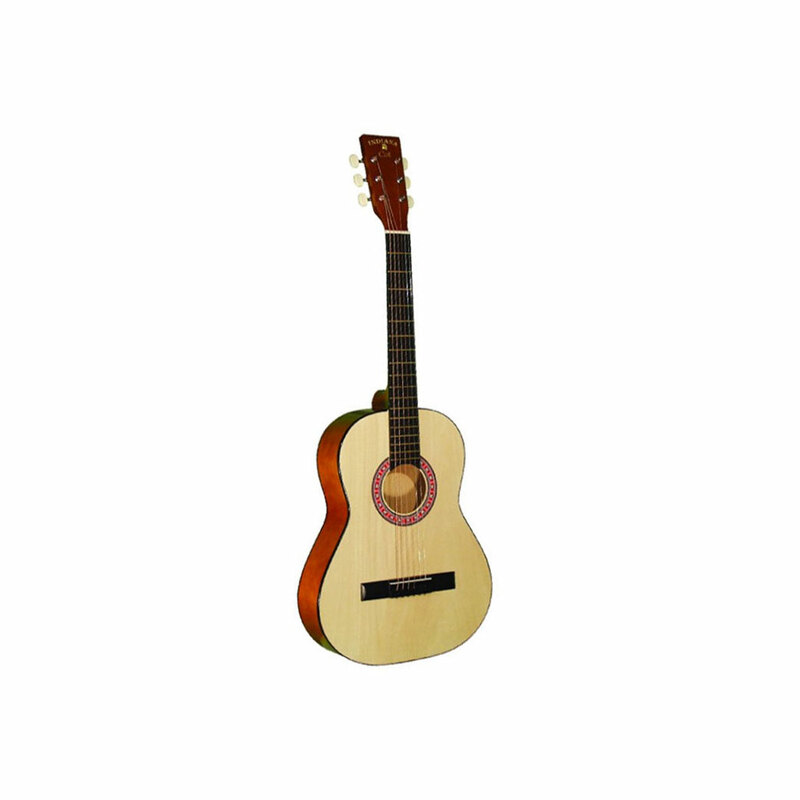 Players of all styles love the more compact body size without compromising projection and tone. 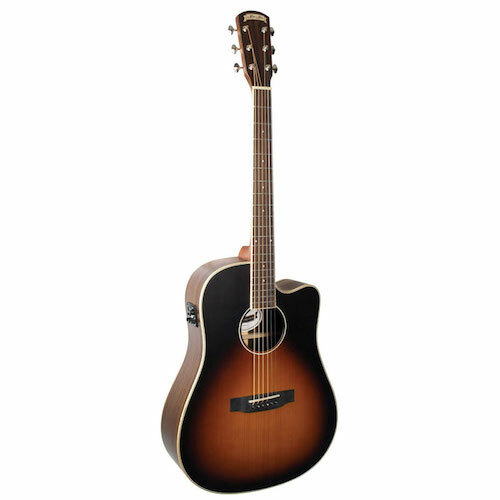 Above all, the Madison is a fantastic playing instrument right out of the box! Nickel silver frets set into a blackwood fingerboard provides consistent action from first position to the twentieth fret. Adding an active preamp with 4-band EQ means you have total control of your tone in live or studio settings. Available in four custom colors, the Madison Quilts are candy for the eyes and ears! The Indiana Thin Body Acoustics give you all the sonic punch you need but in a more compact body size. Starting with a spruce top that's matched to mahogany back and sides, the I-TB2 Series were created for acoustic players that find that a traditional dreadnought body size is a bit too bulky. Having a tighter profile gives these guitars and almost electric guitar feel and they're perfect for the stage or studio. Great action and playability right out of the box! An on-board 3 band EQ gives you total control at the touch of a button and all players love the extended cutaway for upper fret access. Sealed diecast tuners, nickle silver frets, gold hardware, high gloss finish and 10 Year Warranty make the Indiana Thin Body Acoustic series a great alternative for any player. Indiana - Colt 36” Student Guitar- Natural-$109. 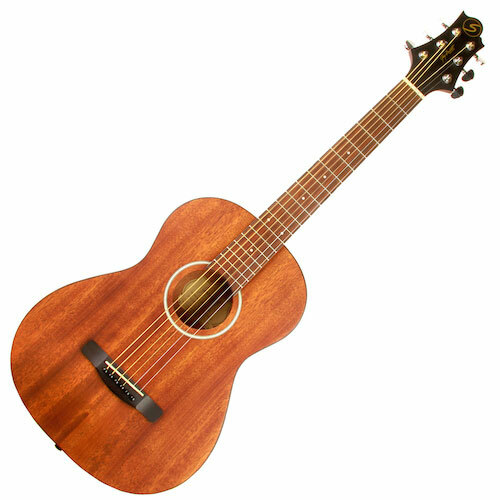 The Indiana Colt is a 36” -3/4 scale, student size, steel string acoustic guitar. 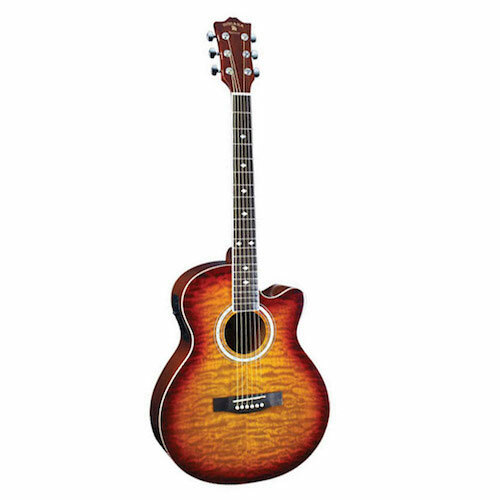 Don't let the low price and small size fool you, this guitar is no toy. 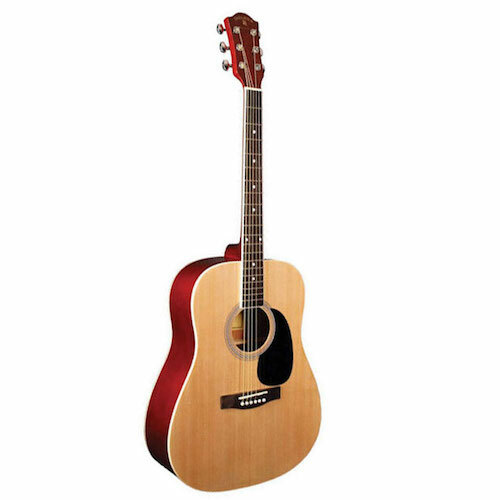 In fact it is the guitar of choice for many teachers and has a big tone that may just surprise you. It's not only great for beginners but the smaller overall size makes it a great travel guitar as well. 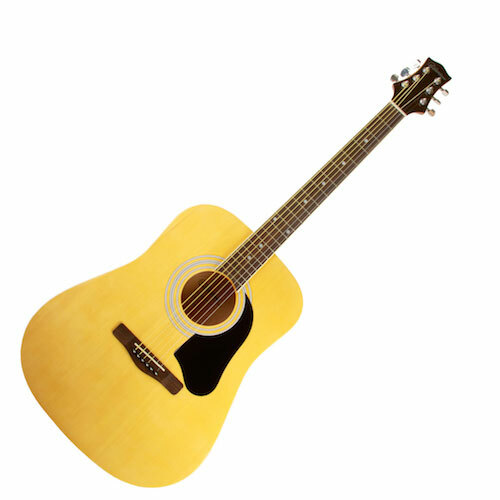 Backpackers love it too, in fact this is a guitar that has traveled the length of the Appalachian trail and with the included tuff nylon gig bag you can literally take it anywhere! 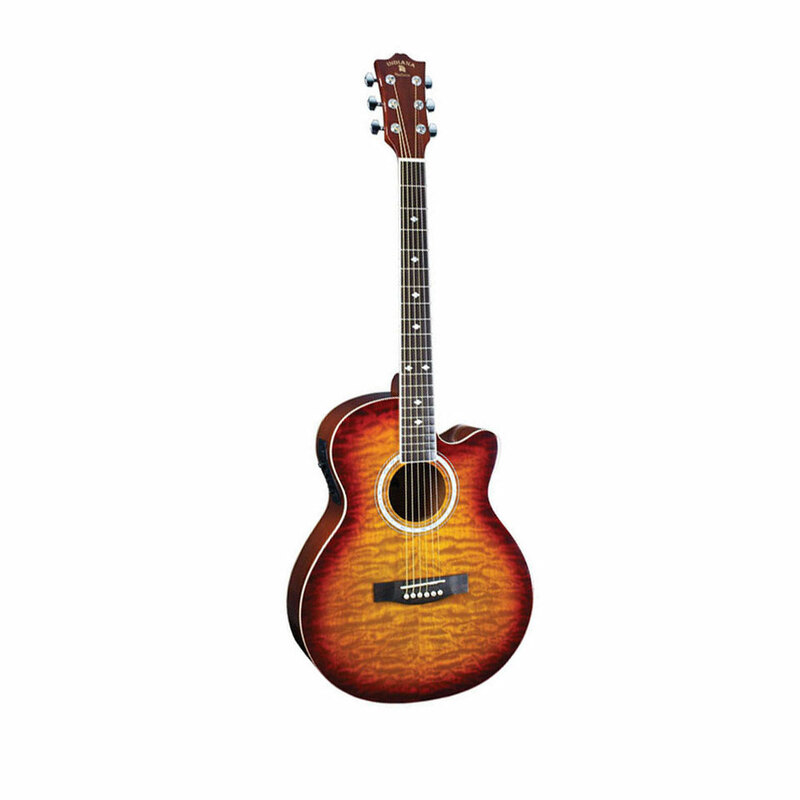 Top it all off with a written 10 year warranty and you have one sweet little guitar that will last you for years to come! 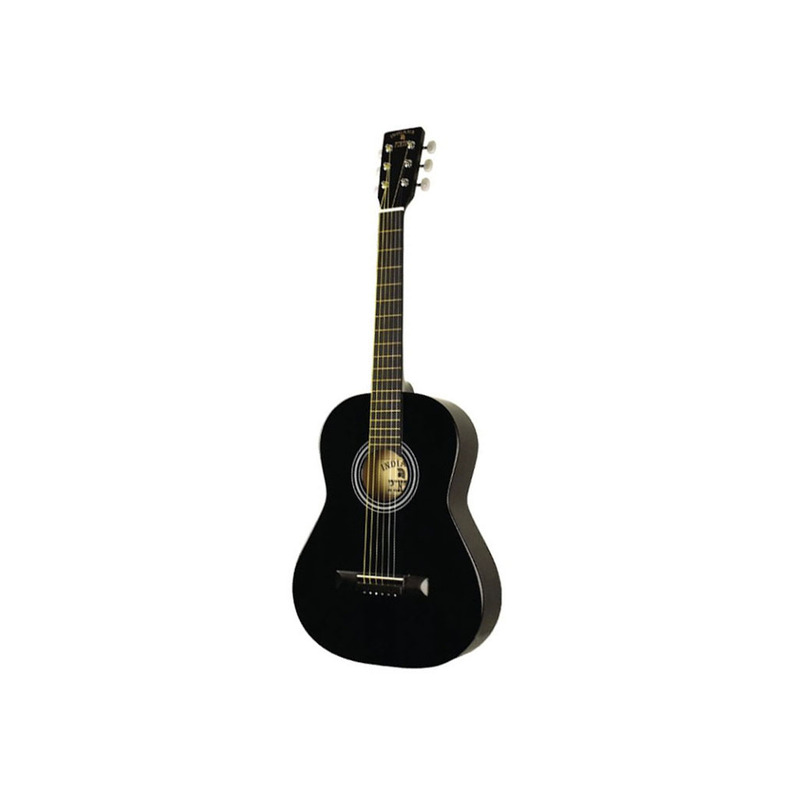 Indiana - Pinto 36” Student Guitar- Black-$109. 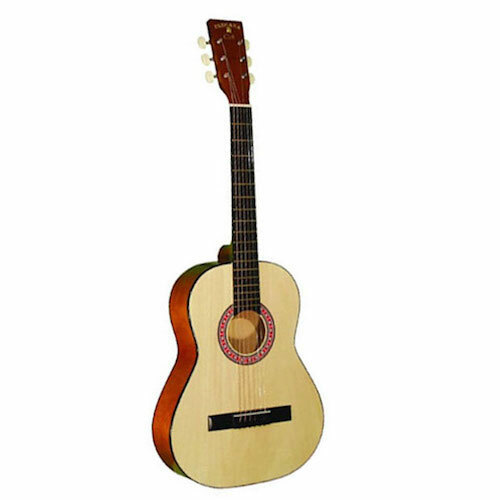 The Indiana Pinto is a 36” -3/4 scale, student size, steel string acoustic guitar. Don't let the low price and small size fool you, this guitar is no toy. 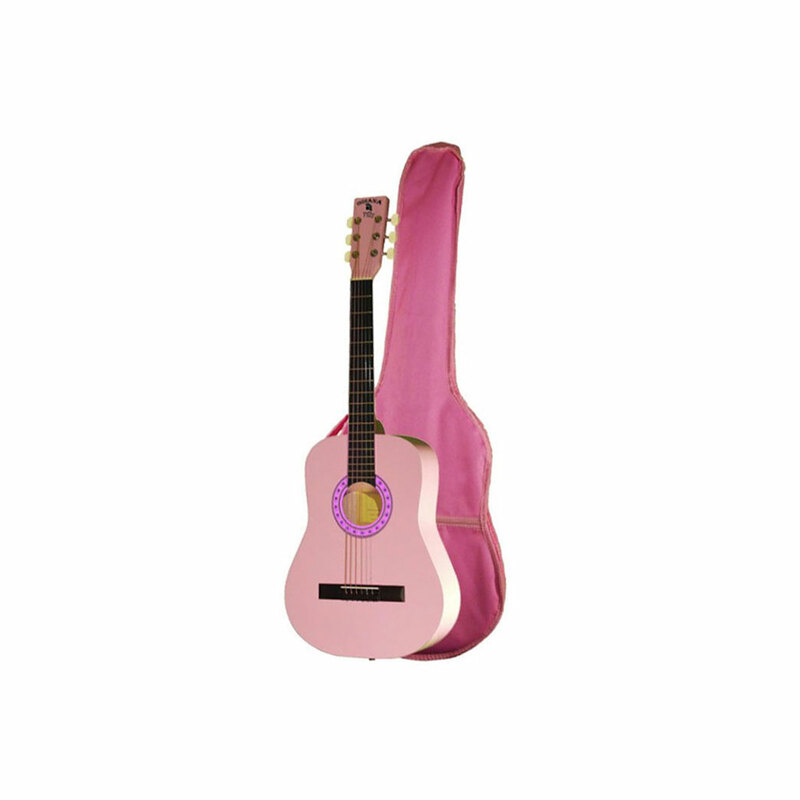 Indiana - Filly 36” Student Guitar- Pink - $109. The Indiana Filly is a 36” -3/4 scale, student size, steel string acoustic guitar. Don't let the low price and small size fool you, this guitar is no toy. 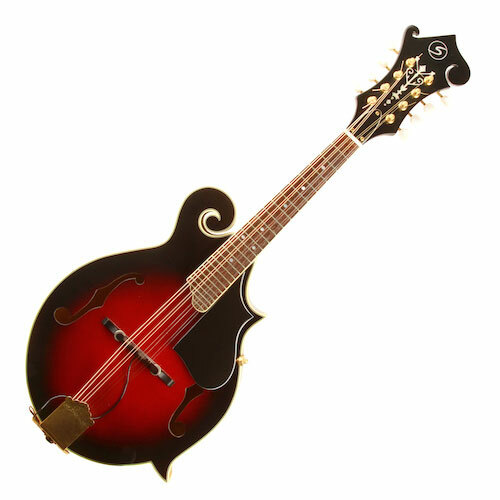 Greg Bennett MF2 Mandolin - $549. 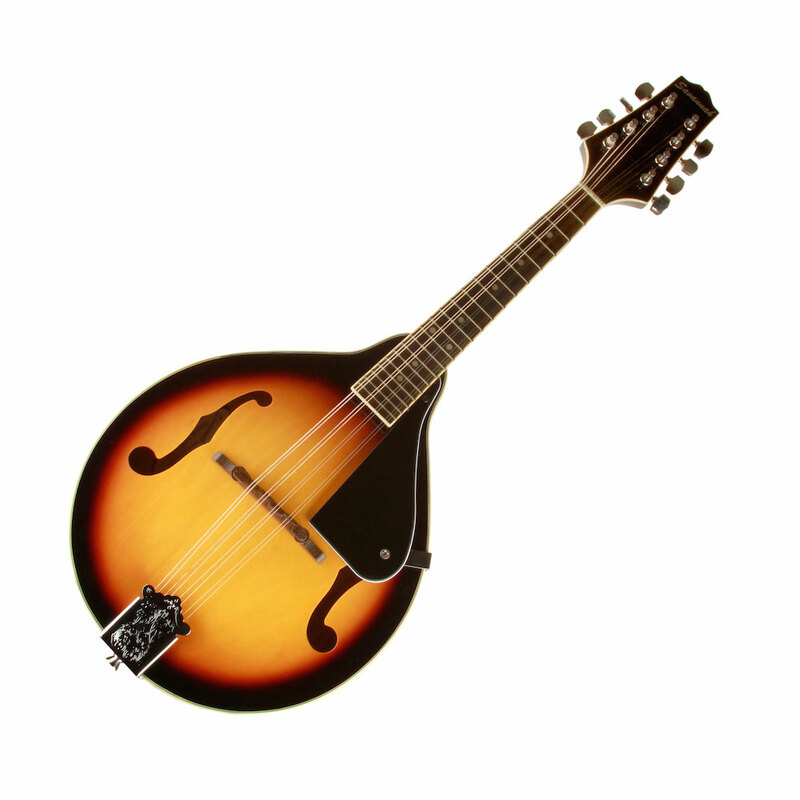 The HATFIELD™ series Florentine mandolin is the ultimate icon of the bluegrass world. 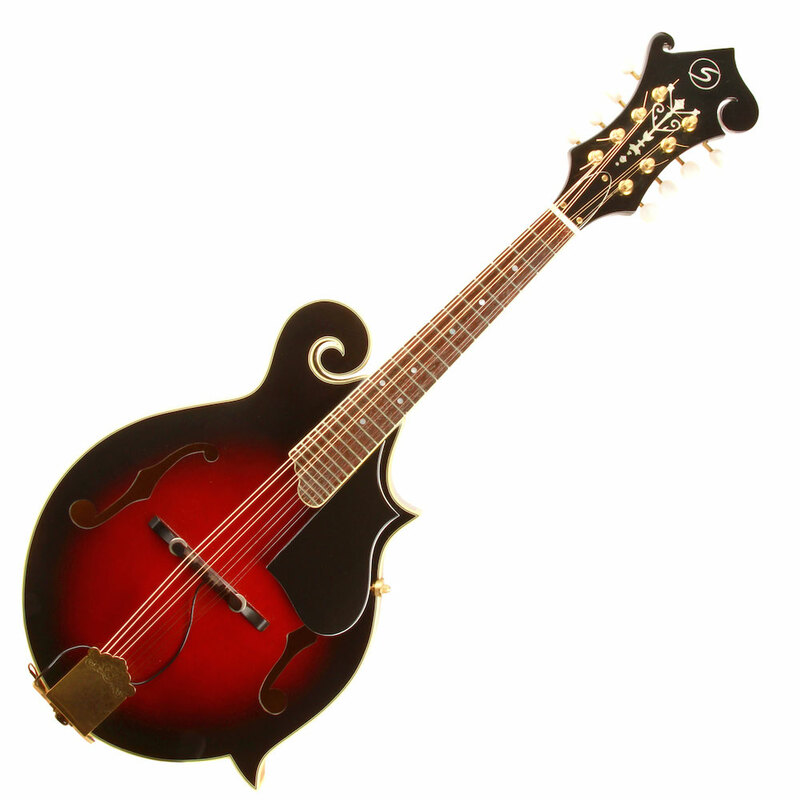 For serious mandolin players, it is probably the most sought after instrument. The shape is not only beautiful, but is a tribute to the great acoustic designers of the early 20th century. 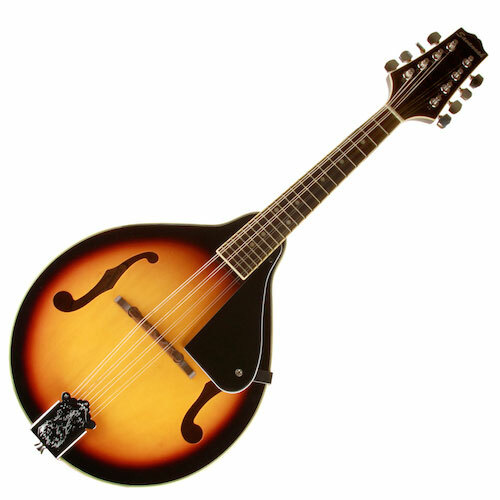 This mandolin has an amazing bark and the ability to cut through the most raucous bluegrass band. Still, the sound is full and sweet. This is one of those rare instruments that lets the artist express himself with an amazing range of tone, texture, and intensity. 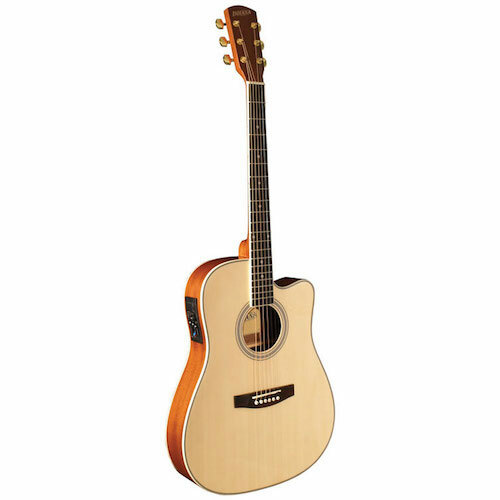 Again, the tone and power are shaped with a spruce top and Quilt maple sides and back. Greg Bennett UK 100 - $209. The Ukulele has been responsible for launching countless guitar players. 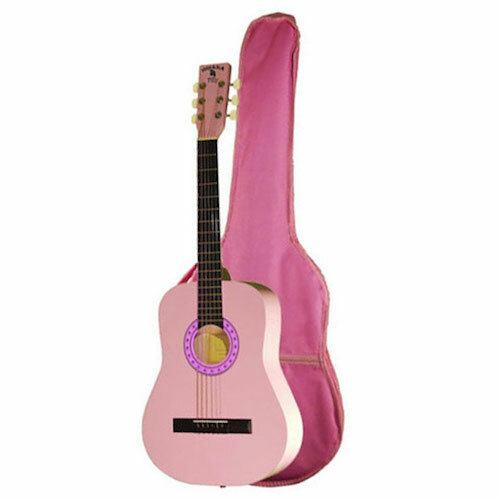 It makes an ideal instrument for someone starting out to play, because of the simple chord forms and compact size. A beginner can be making music right away. 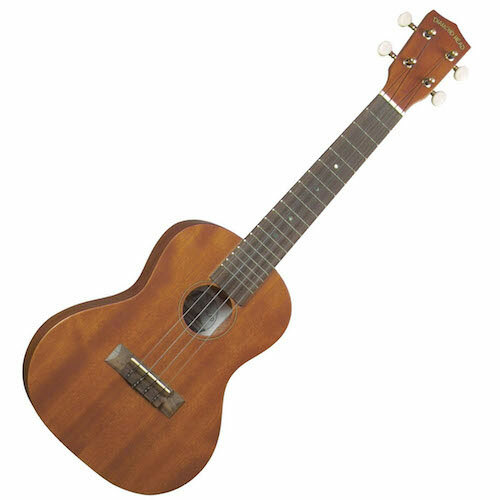 Diamond Head Concert Ukulele DU200C - $84. Diamond Head Natural Mahogany Student Ukuleles – Beautiful mahogany really brings that island sound! For over 100 years, ukuleles made from mahogany have been some of the most popular and sought after of all designs. The warm rich tones that result from using mahogany in the construction of this series is well suited for traditional Hawaiian music and even modern interpretations of classic pop songs from any time period. 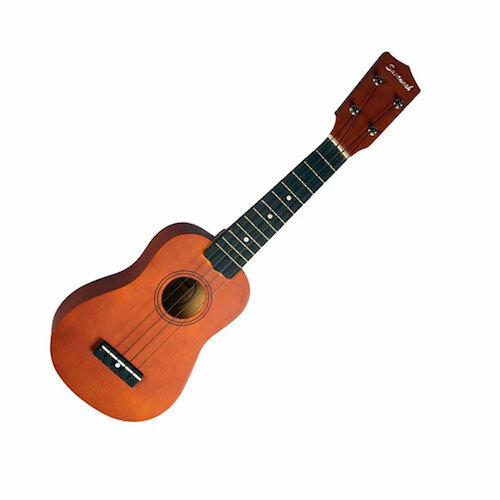 It is often assumed that affordable ukuleles are more “toy-like,” than taken seriously as a bonafide musical instrument. With a Diamond Head Mahogany Student Ukulele, the same attention to detail that might only be found in more costly instruments is applied to each and every model in this series. The body shapes are correct, the scale lengths are perfect and from all angles, the construction is clean and will exceed expectation every time. The DU-200 is a series of mid-level instruments that have that classic look – regardless of body style – that will immediately appeal to the individual who wants a look with features found on more expensive instruments. The rosewood fingerboards have accurately spaced and smoothly polished frets, while the gold-plated guitar-style, geared tuners provide a level of accuracy that planetary-style tuners cannot match. 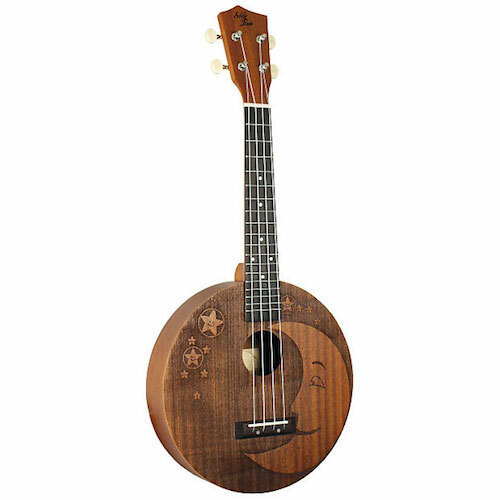 Eddie Finn EF-Moon Ukulele. $129. For sheer uniqueness, it doesn’t get much cooler than the Eddy Finn EF-MOON uke. 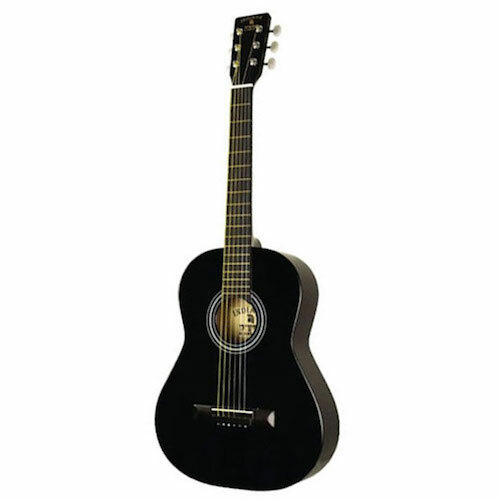 Despite it’s circular shape, the EF-MOON is comfortable, balanced and easy to play. Because of the oversized body, the EF-MOON generates a sizeable amount of bass response when compared to other ukes and the opened grained matte finish gives it a great vintage worn feel! Eddie Finn KOA EF-28-C Ukulele. $269. 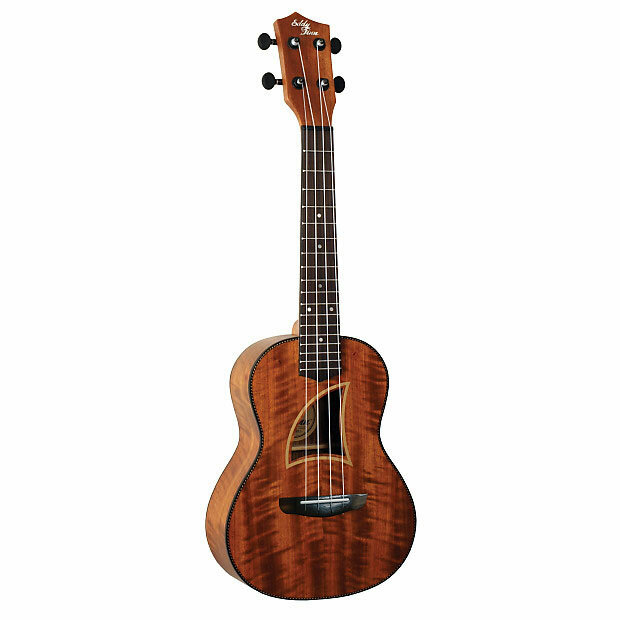 The EF-28-C is an all KOA concert sized uke that captures the true essence of the islands. Beautiful herringbone binding accentuates the gorgeous KOA top, back and sides while the mahogany neck and walnut bridge brings the unmistakable tone into sharp focus. The EF-28-C is everything the traditional player could want. 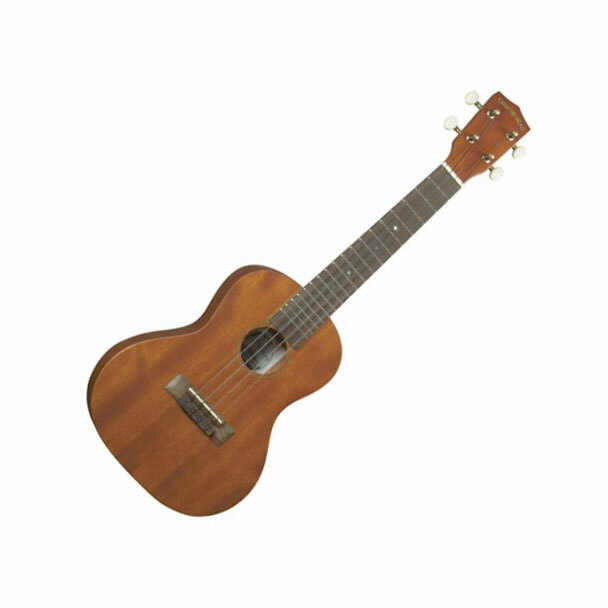 Savannah Soprano Ukulele SU100 - $54.